Far to the south of the known world, there lies an ocean of sand, where the bonechilling nights give way to the blistering heat of an unforgiving sun. It is the land of a warlike nomad people, where water is more precious than gold. And yet, is the thirst for gold that drives men to enter this harsh desert. For many, their sunbleached bones are all that remains of their brief passage. Most of the time, if the nomad warriors don't get them, than the desert will, but it is not there that lies the greatest danger. The pharoahs grew more and more obsessed with their death. They brought thousands of slaves from neighbouring nations to build huge tombs. In these tombs, many traps were built to discourage graverobbers, for not only were the kings of this land joined in death by hundreds of slaves, they were also burried with great treasures to fulfill all their needs in the next life. But the manmade traps are not the only danger that lurks in these ancient pyramids. The sorcerers of this land were very skilled with all kinds of magic, including the necromantic arts and they made sure that their masters would not be disturbed in their final resting place. This is the manufacturer of the game "Wargods of Ægyptus". Each player collects and paints his own army, The Children of the Gods -- mortals made in the image of the proud gods of Ægyptus... Anubis, Bast, Horus, Set, Ptah, Khanum, Sebek, Thoth, Isis and Osiris. 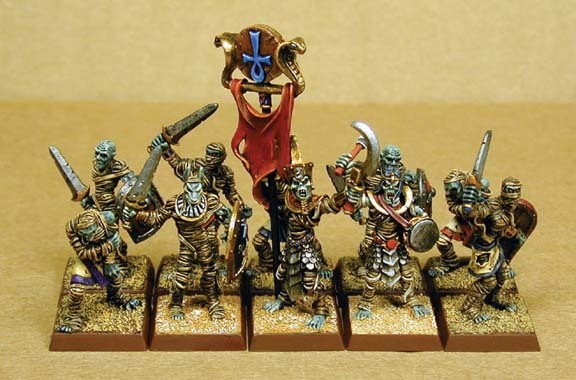 Aside from miniatures representing warriors from different ancient Egyptian Gods, there is also an undead army. They're mostly mummies so far. While most of them were clearly human when they were alive, there are also some representing other races of Æguptus. There's even a - somewhat odd - undead sphinx. 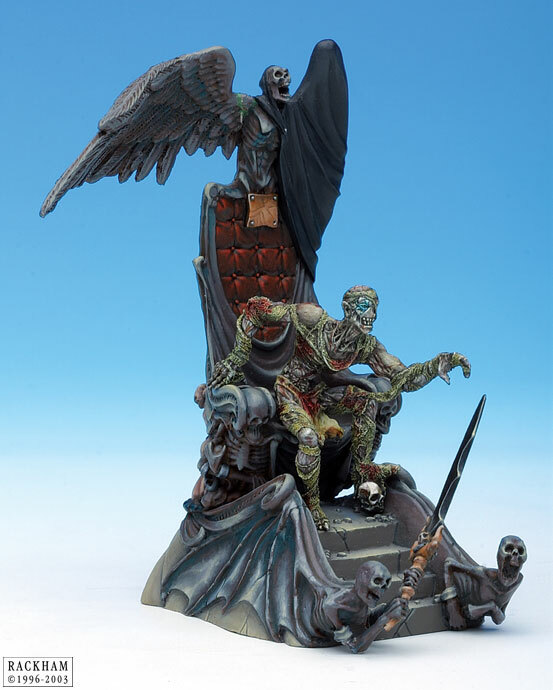 But don't limit your frothing to the undead models, take a look around, there are many miniatures in the range that could find a place in your army, including some excellent chariots (you can replace the crews if you want). They also make a wide variety of metal shields (17 different ones!) that are available separately. Furthermore, they produce some nice scenery to decorate your battelfield. Reaper's "Dark Heaven" line is famous for undead characters. While some are sitting on the fence between the gothic and the egyptian theme, others are just the thing you've come here looking for. They also make a giant scorpion and a scarab swarm. 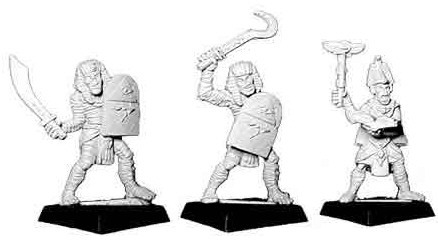 And don't forget their newer "Warlord" range either. As you can see from the pictures, the models in the "Dark Heaven" line come with solid bases, so some extra attention will have to be paid to rebasing. The "Warlord" models have slotted bases. 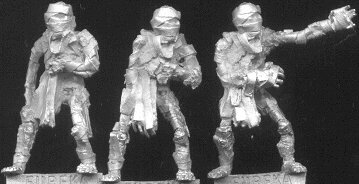 This French manufacturer of resin miniatures offers a (small) handfull of suitable models. Take note that the resin is somewhat fragile. There may be lots of flash, but that is easily removed. 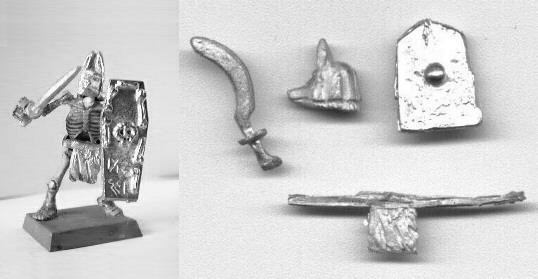 The models come with solid square bases. Due to the softness of the material, rebasing will be easy, if you should desire to do so. You all know the manufacturer of Confrontation miniatures, so I won't bother introducing them. The most appropriate model for our purpose is the amazing "Sophet Drahas", on his throne. The throne in itself, although impressive, is not very much in theme, but Sophet himself is clearly a Mummy Lord. 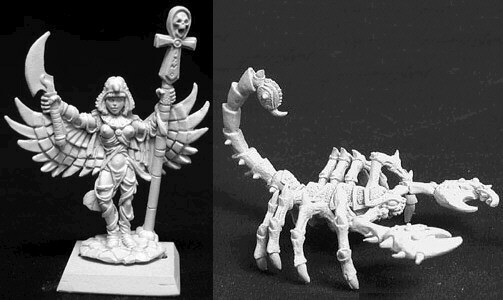 This is the Australian manufacturer of a wide variety of minis, including some mummies, egyptian skeletons, Bast and Anubis warriors. Interesting option is that you can suggest a mini you'd like them to make and if enough people are interested they'll make it. I haven't seen any of their models in the flesh yet, so comments will be limited. The models come with slotted bases. 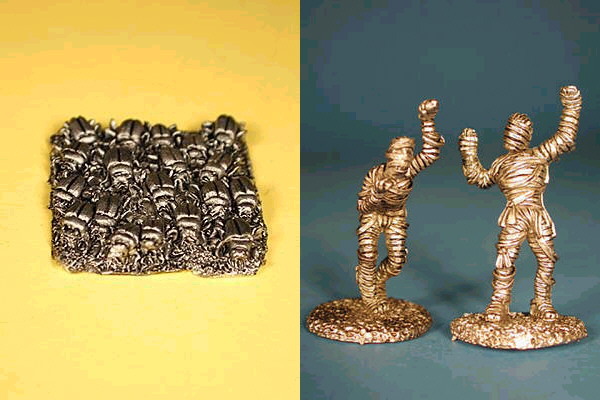 This manufacturer of resine miniatures seems to have switched to pewter. 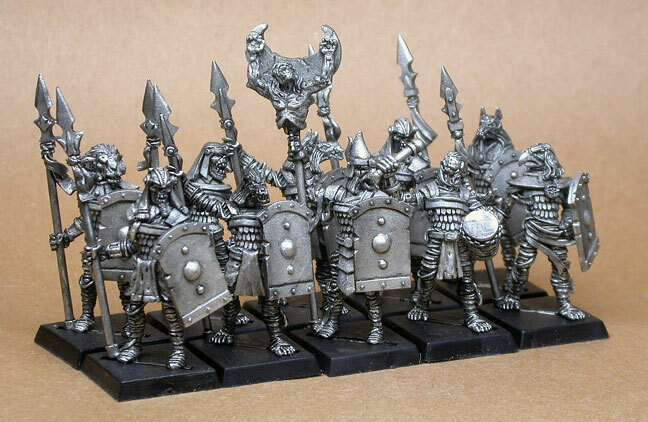 The miniatures are not of the highest standard, but offer some affordable alternatives for some of the more pricy stuff. Only Mummies. 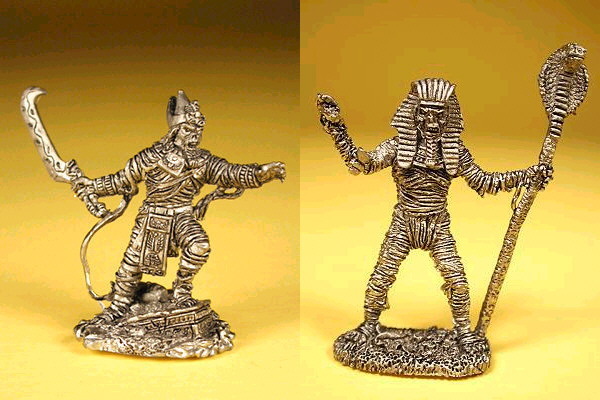 This company, which used to be called Icon miniatures (and before that harlequin miniatures), has a couple of mummies in the "Harlequin Fantasy" and "Fantasy armies" ranges. You may also want to take a look at some of their skeletons and catapult at All Things Bony .There are 8 different mummy models, spread over 4 packs, surprisingly sold without doubles. They use plastic slotted bases in the standard sizes. It may also be worth to take a look at their historical Ancient Egyptian Chariots for conversions. 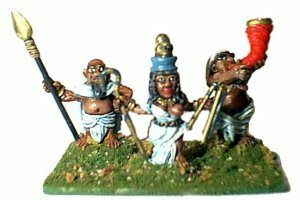 This company brings us some nice Egyptian Dwarves, including dwarf mummies. Something for our vertically challenged frother friends. 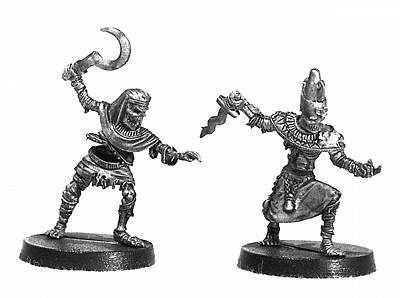 Now, normally, I'm not too keen on the Amazon models, but for Egyptian themed undead they offer a decent enough Anubis conversion kit for plastic and metal skeletons. The kit contains an Anubis head, wrap around loin cloth, khopesh sword, and coffin shield, they have a variant that comes with an Egyptian standard. 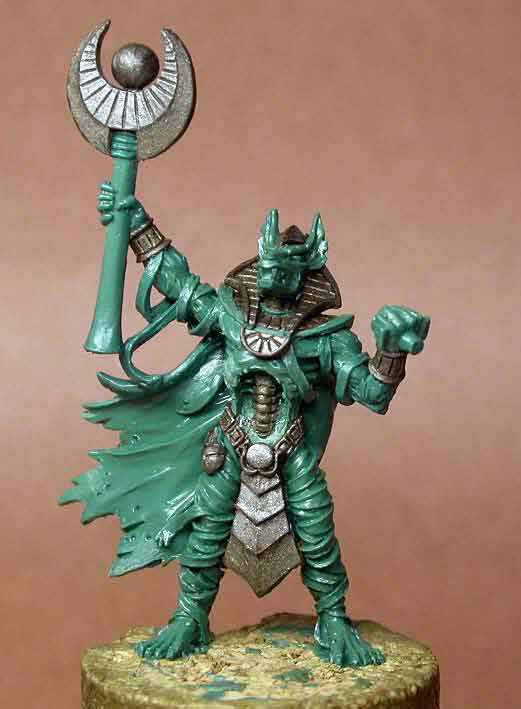 Other available models include a sarcophagus with removable lid and some (not so great) Anubis warriors. This is an older manufacturer and it shows. They still offer a few suitable models: a decent enough looking mummy, one that looks rather dated and a giant snake that you may find some use for. You will have to (re)base these models, but that shouldn't be so difficult. In their "Gothic Horror" line, you'll find a rnage called "The Mummy". Aside from some archaeologists, graverobbers and other minions, this range naturally has some mummies. 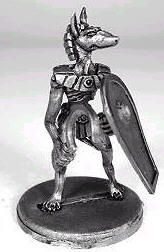 This is one of the older manufacturers of fantasy and historical miniatures and as such it has expanded into many regions of the fantasy realms. A small word of advice though, while many of the RAFM miniatures are of a good to very high quality (crisp details, little flash or moldlines), some of the older ones are a bit below standard. Rebasing will be required as they come with solid bases, real solid. The famous manufacturer of fantasy and historical miniatures. 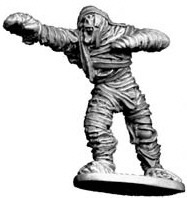 They did one mummy a while back as a limited edition free giveaway, which unfortunately is no longer available, but it does appear on eBay now and then. You may also want to check out their Ancient Egyptian Chariots for conversion purposes, but be warned that they will be smaller than your fantasy miniatures. 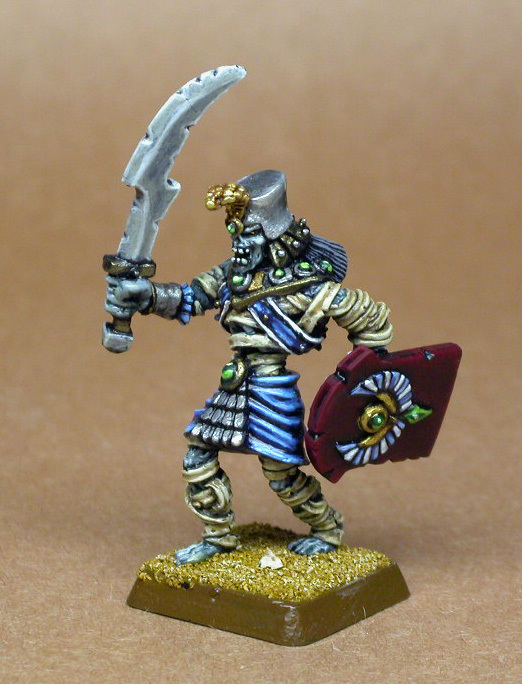 Ral Partha used to do some nice mummies. 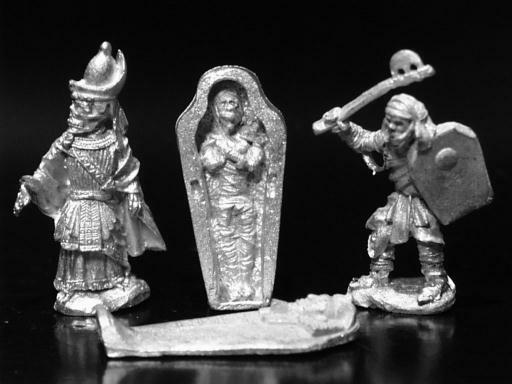 The old Ral Partha lines are now being distributed by Ral Partha Europe and Ironwind Metals (in the US). Offers a pack of 6 mummies in their science fiction range. Basing required. 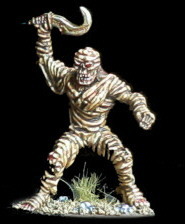 Until recently this sculptor offered a pack of "bad things" horror miniatures, including a mummy, but unfortunately it would seem that this was discontinued. Maybe he will sculpt some new ones later in one of his other ranges. 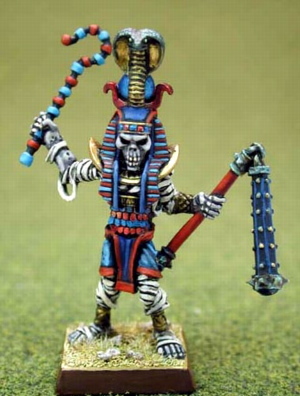 Naturally, lots of old fashioned rank & file skeletons can easily be integrated in your Egyptian themed undead armies, especially if you arm them with appropriate shields. For the skeleton showcase, go to All Things Bony. 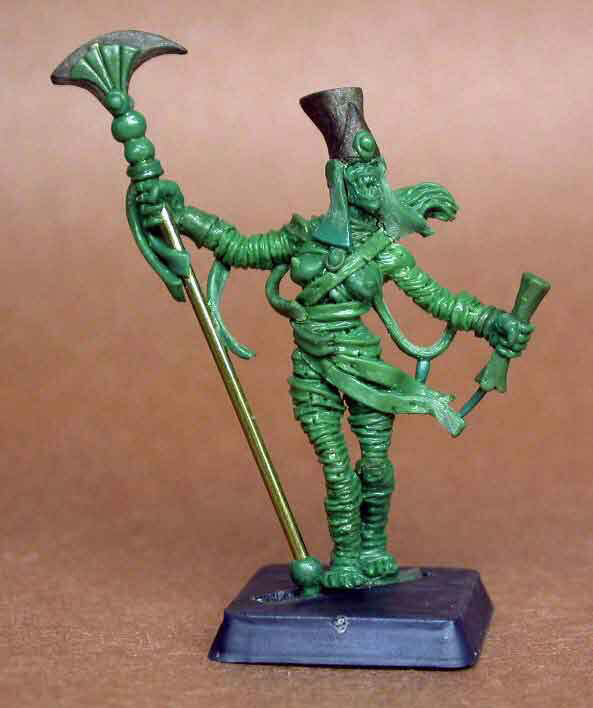 Don't forget to look at the Tombs of the Pharoahs Scenery Showcase for some cool stuff to embellish your gaming table. More undead allies can be found in the All Things Bloody (vampires) and All Things Rotten (zombies) showcases. If you feel that I left out a company that should be listed or if you represent a company that was left out or whose products didn't get the credit and appreciation they deserve, feel free to contact me on the FU-UK! Froth Forums or directly by clicking here.